Chicago Piano Tuners is celebrating their grand opening with a limited time offer of buy three, get one free piano tunings! Chicago Piano Tuners is celebrating their Grand Opening with a Buy Three, Get One Free in January piano tuning deal. Owner Caleb Crockett has been tuning pianos for more than 15 years, and the mission of Chicago Piano Tuners is simple. They want to make the music of Chicago sound just a little bit better, one piano at a time. Crockett is a piano technician working with musicians, teachers, piano dealers, and schools to keep their pianos in tune and proper working order. Over 15 years, he has worked on thousands of pianos, ranging from Kimball spinets, Baldwin consoles, and Yamaha grands to nine foot Steinway concert grands. Online scheduling is available through the Chicago Piano Tuners website, and while they’re tuning, they can also fix your wobbly piano bench. 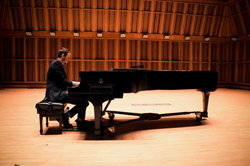 Chicago Piano Tuners is dedicated to making your piano sound as good as the day it was made.